Ready to make some beautiful noise? We’ve been looking for top-notch sound systems that pay as much attention to aesthetics as they do to audio quality. 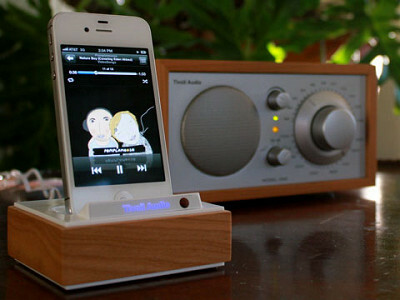 And Tivoli Audio makes it clear that beauty can be seen and heard. Audio industry veteran Tom DeVesto founded the Boston company to create innovative, easy-to-use audio products that have exceptional sound quality and won’t break the bank. Tivoli’s tabletop radios and portable systems have a streamlined, classic look with sharp colors and retro-inspired knobs. For room-filling sound, the Model One AM/FM table radio includes a full range speaker and an auxiliary input so you can use it with an iPod or other portable music player. For music on the go, Tivoli’s iPAL portable speaker and radio tuner delivers big sound in a small package. If you’re keen on tapping into Internet radio broadcasts, NetWorks FM is the way to go. It’s an Internet radio that lets you listen to any station around the globe -- from New York to New Zealand and anywhere in between. And for iPod users, Tivoli’s Connector lets you listen to your favorite iPod tunes, played through Tivoli’s gear, while your iPod charges. Neither your ears nor eyes will be disappointed with this stellar lineup. Hello and Happy Holidays from Tivoli Audio. I’m Ron Sylvester, National Sales Manager, and glad to be here to tell you about two of our most popular AM/FM radios which, by the way, make fantastic gifts! The Model One is our flagship radio. It’s found in homes and offices around the globe. People love the BIG sound it delivers, the simple easy to use design and the beautiful wood cabinets. It’s been described as, “The best sounding table radio ever made,” by MSNBC. The iPAL radio is somewhat of a portable version of the Model One. Same unbelievable sound for its size and simple easy to use design. It’s housed in a weather resistant cabinet and runs on a rechargeable battery pack. At moderate volumes you can get up to 12 hours of playback. Both radios have an auxiliary input to plug in your MP3 player or any stereo source and a stereo headphone output. Another radio we are featuring today which is more than just AM/FM is our Networks global radio. It gives you access to more than 13,000 stations worldwide through the Internet with no need for a computer. You simply log on to a network either wirelessly or wired and you can be listening to opera from Milan, cutting edge rock from London or anything in between all with Tivoli Audio’s signature sound and design. Search stations by genre or location. Networks is also capable of receiving streamed music stored on your computer. We are also featuring today, the Connector . 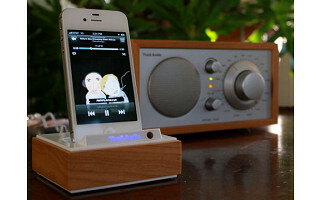 Our iPod charging/playback dock that can be hooked up to any radio and is compatible with all iPods and iPhones. HI I really like the looks of these!! am wondering can you get the radio and the ipod connector together for one price or do you have to purchase them separately?? The radio and the Connector are separate items so they would have to be purchased separately. You can plug an ipod or iphone directly into the radio for playback with a stereo mini cable which is readily available at any electronics store. The Connector will also charge your ipod or iphone in addition to playback. is this also compatible with Android phones? @ Cathleen yes it will. But, unfortunately, it is no longer available. Stunningly retro look and quality sound! Thank you for bringing a wonderful Grommet to our lives. Will this connect to the new iPhone? They changed the adapter. @Barbara Krieger yes it will because it uses the adaptor on the iPhone that did not change. But, unfortunately, it is no longer available. I see the question has been asked already but I second i-Is this going to be made compatible with iPhone 5. It does not have the same connector as iPad, iPod and previous iPhones. @Barbara Krieger & @Elle H. : The Tivoli Audio Team has this to share: The iPal has the cord to plug from the headphone jack of the iPhone 5 to the auxillary input of the radio. For Model One and Networks FM, you have to buy a stereo mini cable to connect the jack to the radio. The Connector is not compatible with the iPhone 5. Ready to make some beautiful noise? We’ve been looking for top-notch sound systems that pay as much attention to aesthetics as they do to audio quality. And Tivoli Audio makes it clear that beauty can be seen and heard. 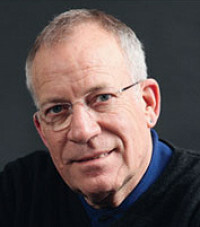 Audio industry veteran Tom DeVesto founded the Boston company to create innovative, easy-to-use audio products that have exceptional sound quality and won’t break the bank. Tivoli’s tabletop radios and portable systems have a streamlined, classic look with sharp colors and retro-inspired knobs. For room-filling sound, the Model One AM/FM table radio includes a full range speaker and an auxiliary input so you can use it with an iPod or other portable music player. For music on the go, Tivoli’s iPAL portable speaker and radio tuner delivers big sound in a small package. If you’re keen on tapping into Internet radio broadcasts, NetWorks FM is the way to go. It’s an Internet radio that lets you listen to any station around the globe -- from New York to New Zealand and anywhere in between. And for iPod users, Tivoli’s Connector lets you listen to your favorite iPod tunes, played through Tivoli’s gear, while your iPod charges.